How many times do we get to the end of a day and wonder where the time went? Despite our best intent, our To Do List appears to have grown longer, not shorter. How can we begin to control the flow of time? Well most time management techniques use goal setting, prioritization and management of interruption as their basis. These principles are laudable and useful but there is something else we can do which is much more powerful and that’s to take better control of our own personal time machine – our mind. A clue to where some the time goes lies in an often over-looked aspect of our consciousness. The normal human mind is only capable of experiencing one thought at a time. Just think about what you are thinking right now and notice how what you are thinking about gets replaced by a new thought. You may need to think about that! In a normal day, our thoughts often wander. We might think about what we are doing in the future, like what we’re having for supper or rehearsing a speech. We might dwell on the past and repeat a conversation that we wish had gone better. When we mull over the past or fret about the future, this has the result of disrupting our efficiency in the Now. Time Tip #1 : when thoughts of the past or the future pop along, just ask them politely to go away and come back when you are ready to deal with them. A thought cannot resist being thought about and will vaporise when we ’talk to it’ in this manner. Before I started meditating in my mid-40’s, I thought it was a waste of time. I was far too busy to fritter away even 10 minutes a day and there was no way I could make my active mind go quiet. Nowadays I know that if I miss out on some form of daily meditative practice, I have a worse day. I am less able to make wise decisions and I miss spotting serendipities. 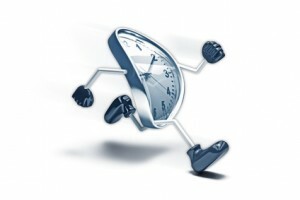 Time Tip #2 : make sure you take at least 10 minutes of ‘me time’ each day, even if it’s going for a walk in the park. Guard this time with passion and note it’s reckoned that meditation extends our longevity by reducing stress and fostering good health. This will give us more time! It’s an urban myth our left brain is logical and our right brain is creative. A closer analogy, for most people, is that our left brain sits inside space and time and our right brain sits everywhere and ‘everywhen’ else. Both experience the flow of time in different ways. Something magical happens when we get both sides of our brain working on the same thing at the same time. Time takes on an ethereal quality and stretches out. Good examples of whole brain tasks are doodling and mind mapping. When we enter this Whole Brain mode, we also seem to emit an Intention Field which prevents interruptions coming our way. Time Tip #3 : before embarking on any creative task, hold your left nostril closed with your index finger and breathe through the right nostril five times. Then close the right nostril and breathe through the left five times. Repeat as necessary. The To Do List can become a weight around our necks, dragging us down and backwards. They can contain a mix of things we want to do and things we feel we ought to do. They may also contain tasks we do out of habit. Time Tip #4 : go through your To Do List and make two columns on a separate bit of paper. Label the first column as a To Love List and transfer over all the things on your To Do List that you love to do, in the order of those you would like to do first. In the second column, labelled To Don’t List, add all the other tasks. Next what you do is go through all the tasks on the To Don’t List and either delegate them or delete them. Optionally, you can also think about what would have to change so you could love doing them instead and then move them over into the first column. When we combine these four tips together, our days begin to take on a magical quality. As they are all free to do and simple to try, what do you have to lose but even more time if you don’t give them a test drive?